The boss of Collision Chaos is the second encountered in Sonic the Hedgehog CD. 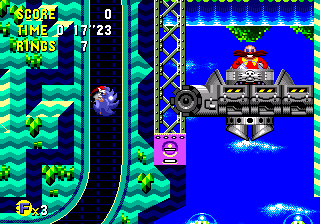 As with many of Dr. Eggman's end-level machines in this game, the Collision Chaos fight requires Sonic the Hedgehog to interact heavily with the battle arena. To match the bumper-filled areas of the first two Zones, the confrontation takes place inside a pinball-like area similar to the Catcher Eggman boss from Sonic the Hedgehog 2 or the bosses of Sonic Spinball, damaging the boss requiring good aim with the various sets of flippers arrayed underneath. Patiently waiting, the good doctor's pod is seen falling into position in the arena's ceiling as Sonic rolls down to enter from below. After traversing a brief passageway, Sonic enters the main body of the playing field. Once inside, Dr. Eggman periodically drops small exploding bombs down into the main arena, though they are harmless if Sonic is curled into his spin attack while trying to be flung up into higher areas. Even though they can be harmless, the bombs, along with both standard and breakaway bumpers, can fling Sonic back to the first set of flippers or, if the player has run into a string of bad luck, the spikes that are located on the bottom of the field. As the spikes are retractable, it is always by chance whether or not Sonic will fall into them or if he'll have the briefest window to jump back up without losing his rings or a life. Once the player is able to maneuver Sonic beyond the many bumpers and obstacles, he can finally hit the bottom of Eggman's latest machine, causing it to move up slightly, a panel appearing now becoming a floor for Sonic to stand on and prevent him from falling back into the main body of the boss encounter. With that first hit, the bomb dispenser flings off, leaving the mad genius completely open to attack, two subsequent hits all that are needed to finish him off. With the pod exploding around him, Eggman escapes in his classic fashion, riding out in his Eggmobile to fight another day. With a jog to the right, the player can have Sonic burst the capsule open, freeing the magical seeds of the Zone and becoming one step closer to freeing the Little Planet. The latter half of the battle, with a defenseless Eggman. This page was last edited on 8 April 2018, at 09:51.